Russian Hebraist and writer on music; born at Podzelve, government of Wilna, Dec. 15, 1853. He studied in the yeshibah of Wilkomir, and received a good musical training at Wilna. At the beginning of his literary career he was a corrector in Romm's printing-house at Wilna, and while there he translated into Judæo-German the "Hilkot De'ot" of the Yad ha-Ḥazaḳah, Wilna, 1876. He also published several pamphlets in Judæo-German, among them "Mishle Ḥakamim." He then published a series of works on music: "Ḳol Yehudah," a musical chrestomathy, Wilna, 1877; "Menaẓẓeaḥ bi-Neginot," a manual of singing and the violin, partly in Hebrew and partly in Judæo-German, ib. 1884; "Zimrat Yah," a manual of harmony, in Hebrew and Judæo-German, followed by a musical glossary, ib. 1885. He has also written the following school-books: "Ḥeder la-Tinoḳot," a Hebrew reader, ib. 1883; "Lahaḳat Nebi'im," a graded Hebrew chrestomathy, ib. 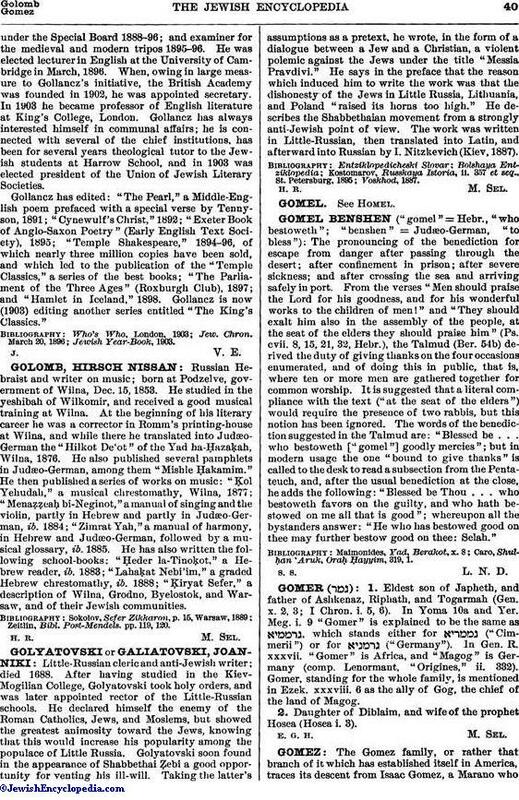 1888; "Ḳiryat Sefer," a description of Wilna, Grodno, Byelostok, and Warsaw, and of their Jewish communities. Zeitlin, Bibl. Post-Mendels. pp. 119, 120.